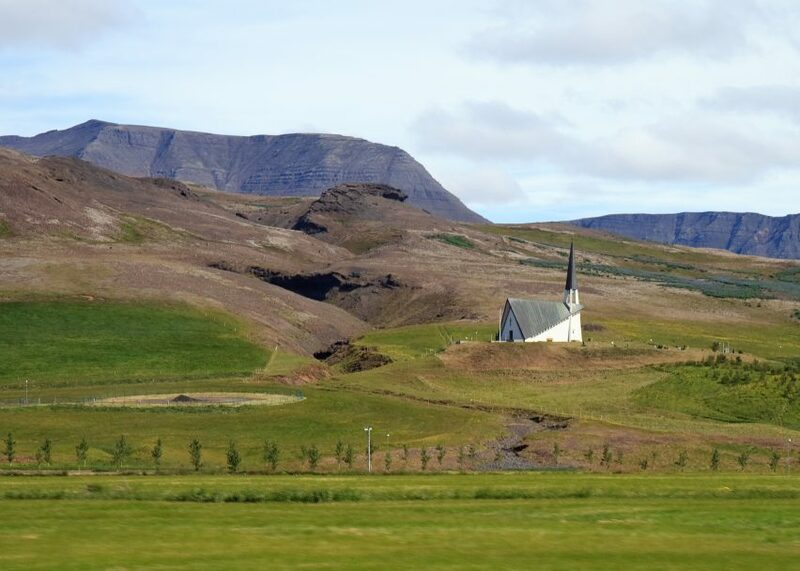 Iceland's dramatic landscape is dotted with equally spectacular religious architecture. 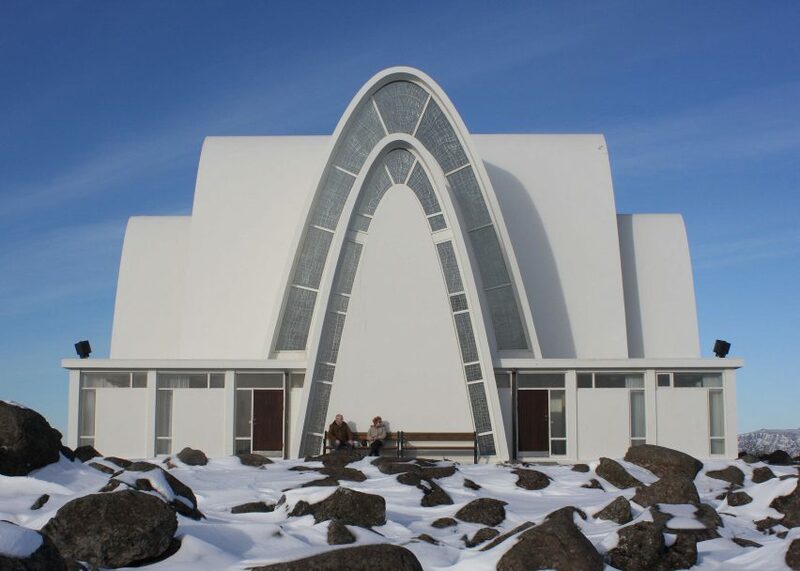 Here's eight of our favourite churches built in the country's unique style, which take cues from Modernism (+ slideshow). 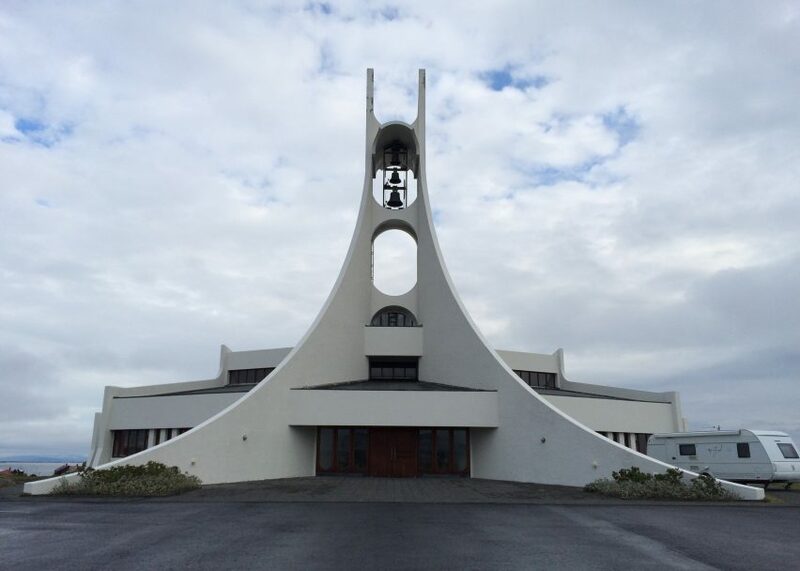 Reykjavík's largest church was designed by Guðjón Samúelsson, one of Iceland's most notable modernist architects who worked on a number of state projects. 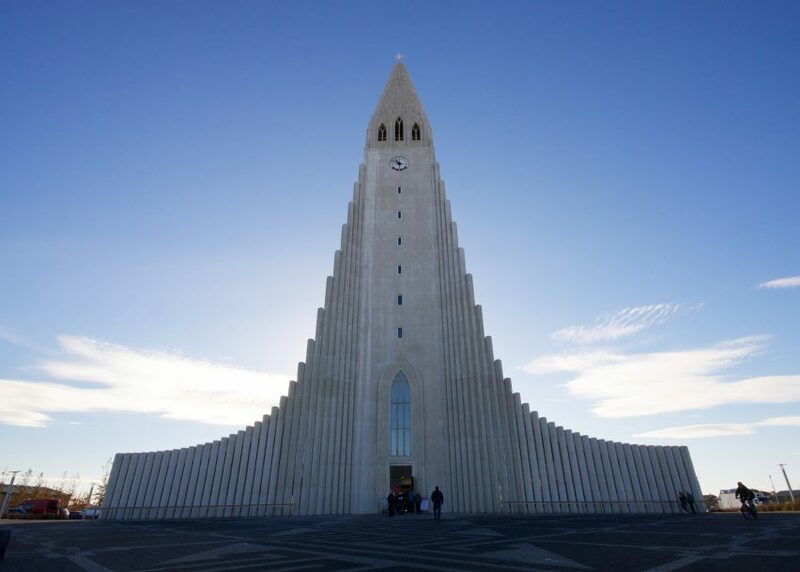 Situated at the top of a hill in the capital, Hallgrímskirkja took 41 years to construct. 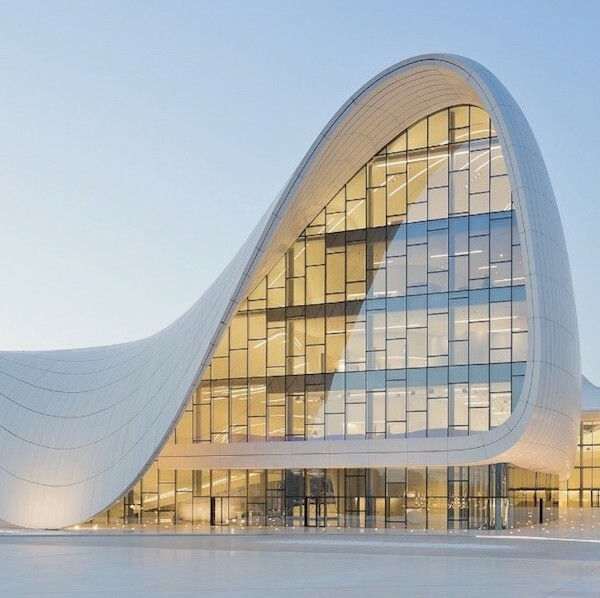 The building presents a staggered fluted facade to a principle axis through the city centre, which terminates at its door. 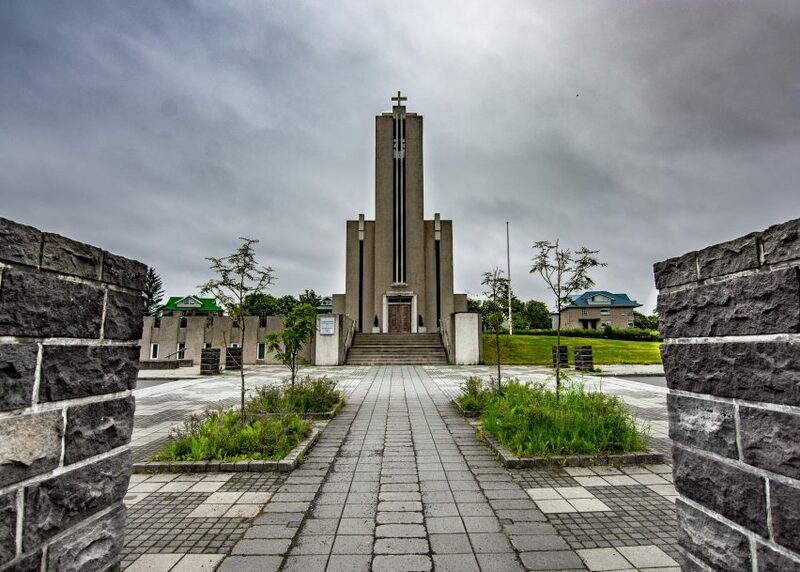 It is topped with a triangular bell tower that visitors can climb for panoramic view across Reykjavík and its harbour. 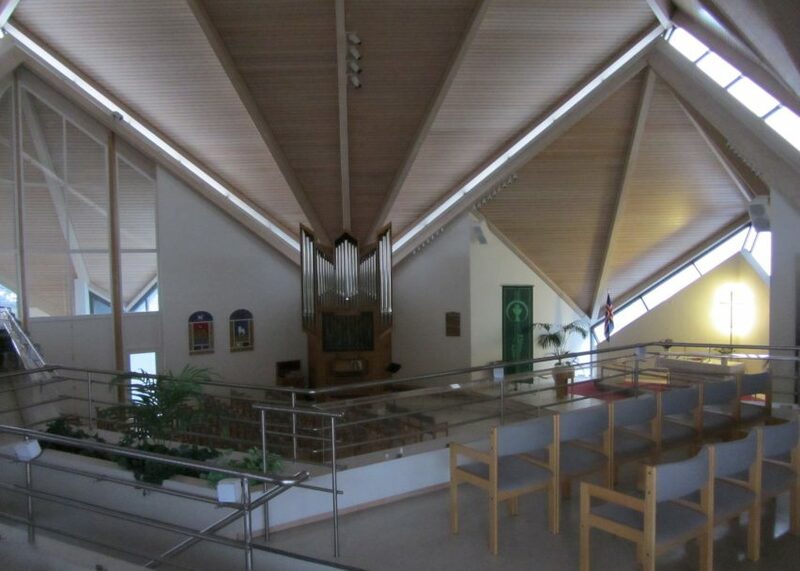 Its interior is an austere grey space with barely any ornamentation, apart from a giant geometric pipe organ mounted high on the front wall. 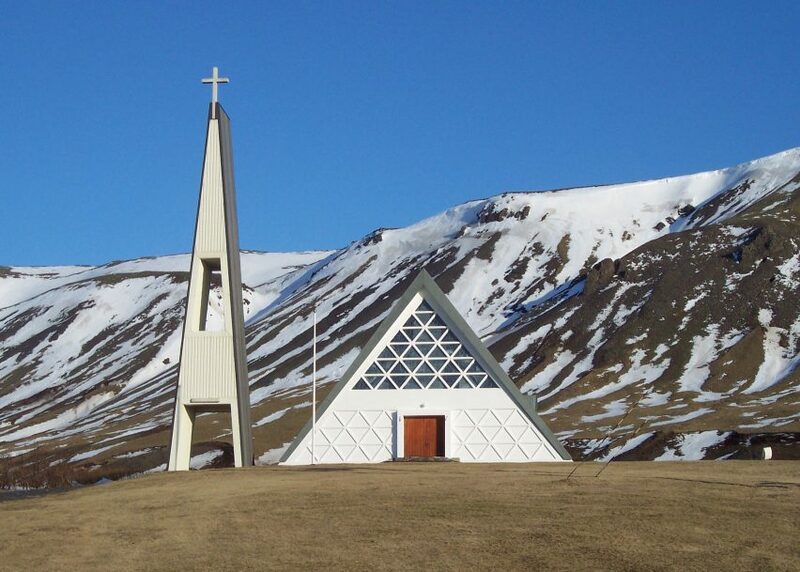 Samúelsson also designed a number of smaller churches across Iceland, including Lauganeskirkja in the west of Reykjavík. 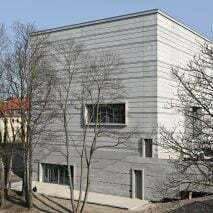 The form of this building is much less expressive than the cathedral, comprising blocky volumes and details including a cuboidal tower and thin rectangular windows. 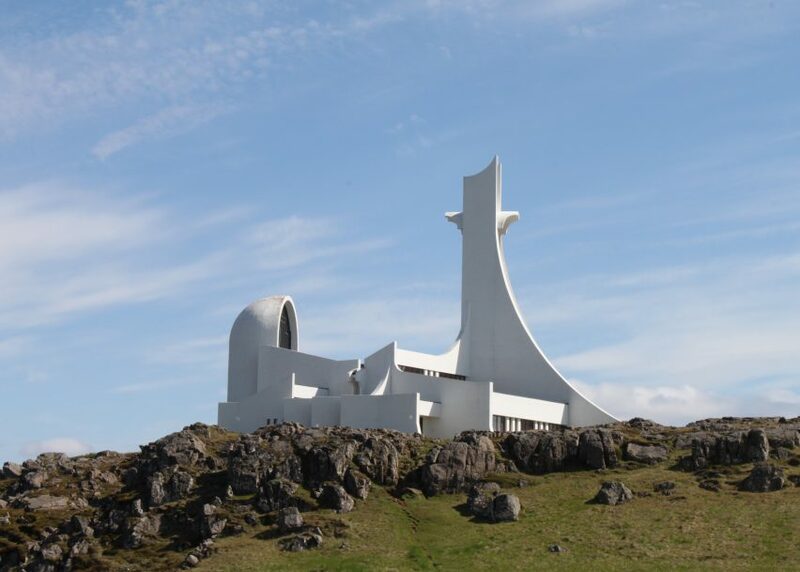 Icelandic architect Jón Haraldsson designed this place of worship on a westerly peninsula. 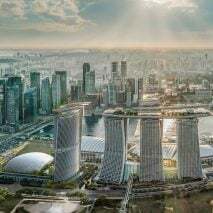 Its most prominent feature is a dramatic bell tower, made from two swooping concrete fins modelled on a whale vertebrae. 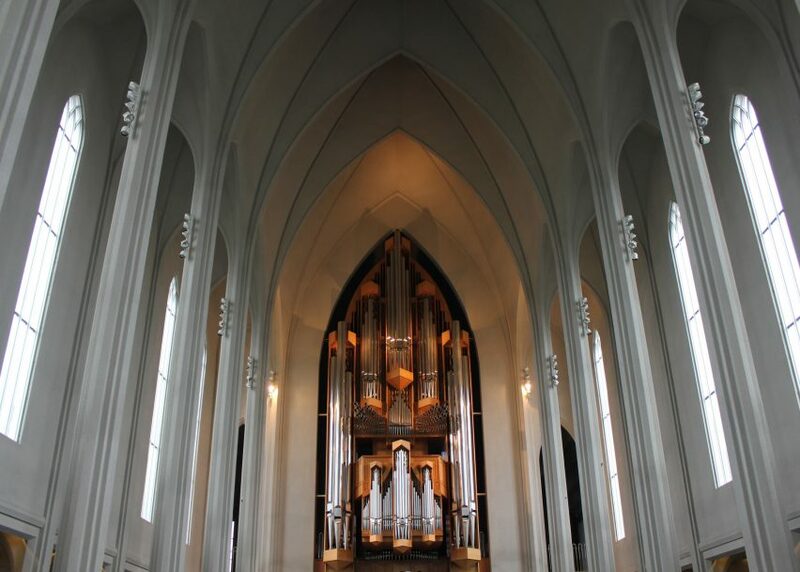 The white Stykkishólmskirkja also features a domed apse, while the interior boasts hundreds of suspended lights, as well as an alter piece by Icelandic painter Kristín Gunnlaugsdóttir of Madonna and Christ. 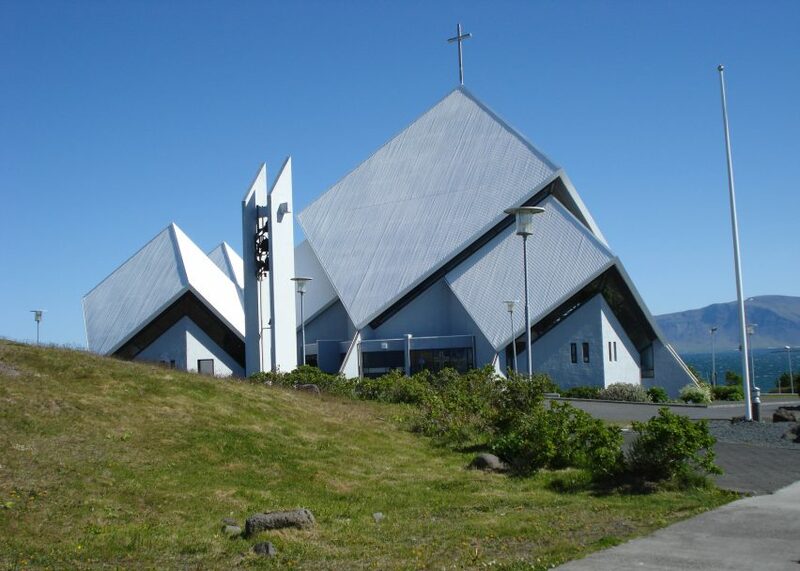 Stóra Dalskirkja, which translates as Great Valley Church, replaced an older church that had stood on the site since 1895. The main building is shaped like a triangular prism, with tessellating three-sided panels and windows across its front. 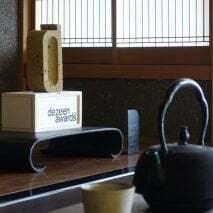 A separate bell tower to one side has a taller, thinner triangle profile. 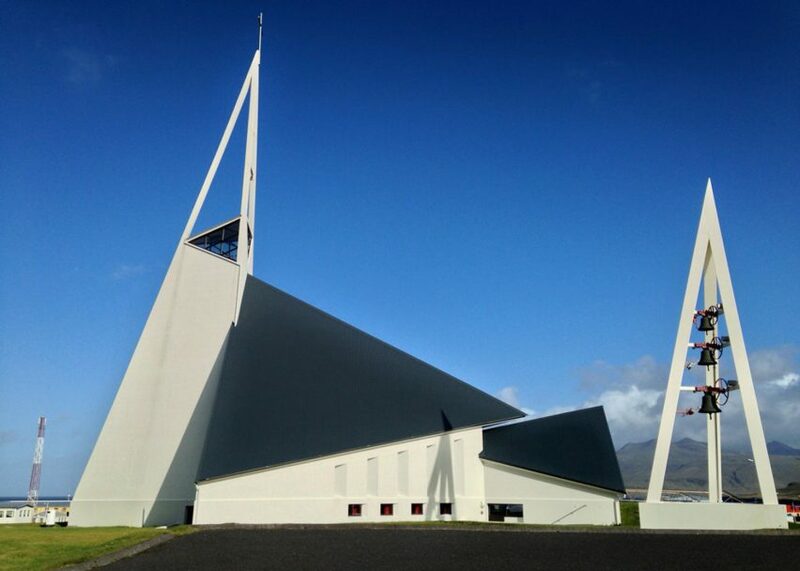 Clearly a fan of triangles, Ragnar Emilsson also used three-sided planes to create this church northeast of Reykjavík. 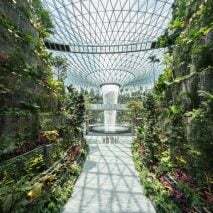 Its dark roof slopes downwards towards the gabled entrance end, with a band of glazing separating it from the building's white walls. 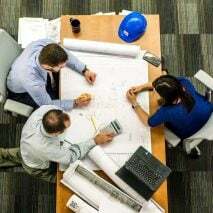 The slender bell tower is placed atop four white supports that intersect with the building's main volume at the other end. 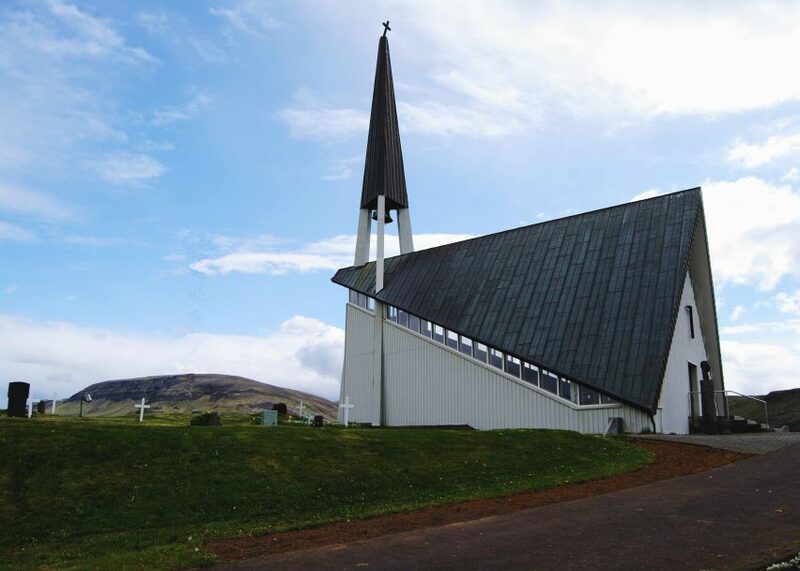 A faceted roof clad in white steel sheets and made up of overlapping rotated squares covers this church in the west of Reykjavík. 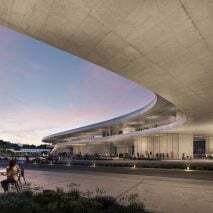 The shape of the roof is articulated inside, where thin gaps between the different sections let light into a variety of spaces, which include a congregation hall upstairs, and smaller rooms for teaching and events below. 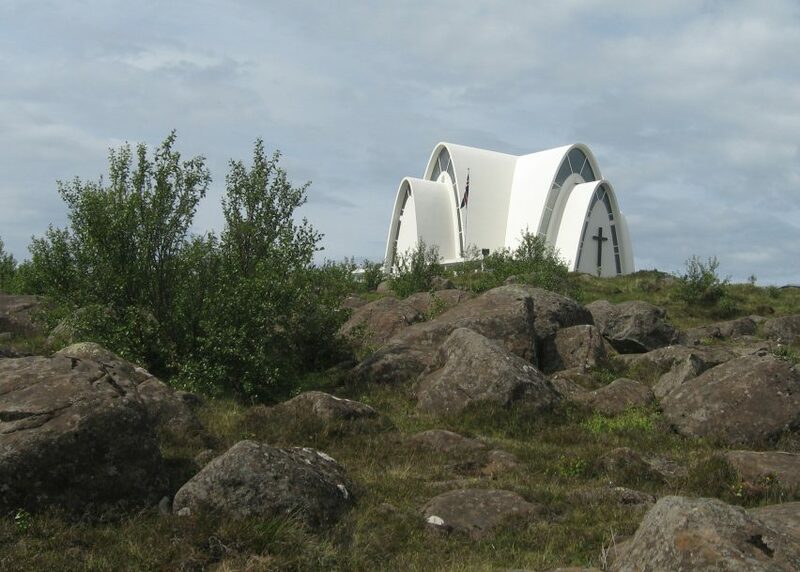 State architect Hörður Bjarnason worked with Ragnar Emilsson to design this white church. 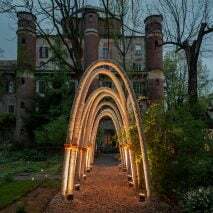 From its centre, a curved arch protrudes in each cardinal direction – with an identical but smaller arch below extending further still. 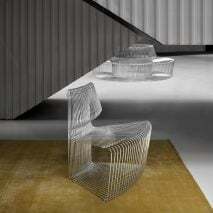 Stained glass bands follow the curves under each roof element. Lower volumes fill the spaces leftover by the tall cross-shaped building to form a rectangular plan. 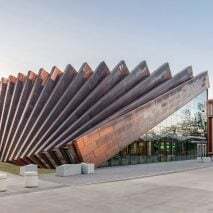 A skeletal spire and separate matching bell tower are paired at this westerly church – another made up of faceted triangular wall and roof elements. 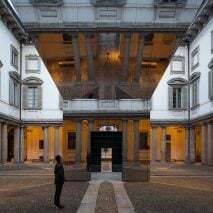 The large antechamber is articulated as a different element to the nave, as its dark roof and white walls angle in the other direction to those of the main volume.